Dan Brown's "The Da Vinci Code"
Compiled and created by Collector, whose technical help has stopped many a computer game player from tearing out his/her hair. Technical help and downloads for many Sierra classic adventure games, including Gabriel Knight. Fansite for the Gabriel Knight series. This site includes a petition and a poll. NOTE: flash intro is nice, but very slow to load. Well-researched fansite on the GK series. NOTE: we strongly suggest you only access this site using Firefox as your browser, as - if you use Internet Explorer - you will be inundated with popups. 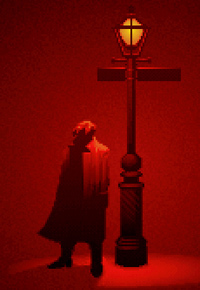 "Gabriel Knight 3" shows how complex narrative CAN work, as opposed to "Da Vinci"
In Sins of the Fathers, the first game in the series, we meet Gabriel Knight, a charming and rakish writer from New Orleans, who manages to survive by running a rare book shop called St George's. His nights are tormented by a recurring nightmare depicting a mysterious tragedy set in the past, which ends with his death; in addition to this, his newest novel with a voodoo theme is not proceeding as he would like. His situation changes radically when he follows the track of a series of brutal murders taking place in the city - murders which seem to be linked to the ancient New Orleans voodoo cult. Hoping to get some inspiration for his book, Gabriel starts investigating on his own and as the clues thicken, they seem to lead to Malia Gedde, an upper-class and inaccessible woman with whom Gabriel falls in love. But the clues also lead, surprisingly, to Gabriel himself. Is it coincidence or destiny? A shadow lies on his family history, and the sins of the fathers will fall on their descendants. To save his life and those of his dear ones, Gabriel will have to confront his fate, and make the most difficult choice of his life.